An energy company has apologised after staff tried to influence a poll on its controversial plans for a wind farm on moor land above Greater Manchester. 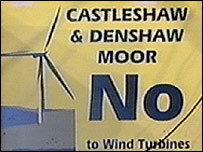 Readers of a newspaper in Oldham were invited to vote for or against seven wind turbines being erected at Denshaw. But 104 votes in favour of the plans were made in 90 minutes from the headquarters of applicants E On UK. The firm said it "unreservedly apologises" for its staff's actions, adding the voting was "inappropriate". The plans, which have met strong opposition from local residents, are due to be considered by councillors at Oldham on Thursday night. The poll canvassing local opinion was run by weekly paper, the Oldham Advertiser. It asked "Do you want a wind farm to be built on Denshaw Moor?". David Lafferty, editor at the Advertiser, said: "The reason we ran the poll was to give the public of Oldham a chance to have their say on what is a highly controversial subject. "What we didn't expect was one of the biggest companies in the world to vote in such a way." Several "no" votes were also discounted due to "irregularities", Mr Lafferty said. 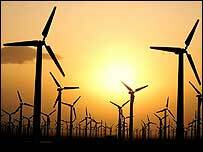 A total of 57% of voters were against the wind farm. E On, a German firm which runs PowerGen, said votes were made by staff members. A spokesman added: "We unreservedly apologise for the actions of our Renewables team who wanted to show their support for the project but chose a totally inappropriate way to show that support. "As soon as we discovered what had happened we instructed staff to stop voting." He added that the firm hoped that councillors and residents would "look beyond this to see the benefits of a wind farm".